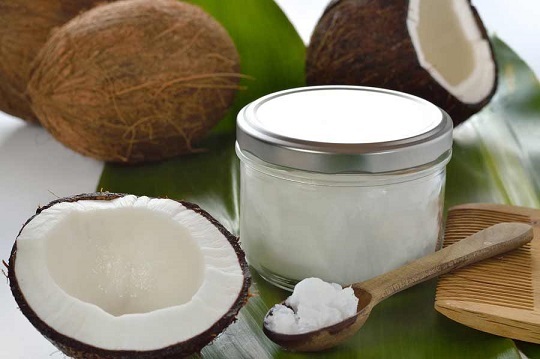 Ever wondered why so many people of all races are crazy about using coconut oil on their hair? That’s because it has amazing hair benefits. Coconut oil can give you a shiny, lustrous and healthy hair. Dr Axe reports that this oil has properties that help strengthen the hair, condition the scalp and help the hair grow (anti-microbial properties, lauric acid and medium chain fatty acids, vitamins, minerals and other nutrients). 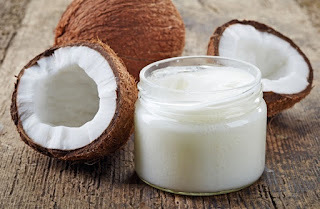 Coconut oil not only benefits us when consumed; it is also a multitasking hair care product that can replace your expensive line of hair care products. It is important that we don’t ignore the other side of hair care; that is what you consume. A healthy diet and lots of water can work wonders on our hair. If your hair is fond of tangling up (especially Africans/African Americans who haven’t relaxed their hair), use coconut oil to detangle it. Coconut oil penetrates the hair shaft making it smooth so they can slide across each other. A study conducted revealed that coconut works better than mineral oil at penetrating the hair follicles and strengthening it. Apply some coconut oil to your hair and use your finger to detangle before using a wide tooth comb. Work your way up to the roots from the bottom. 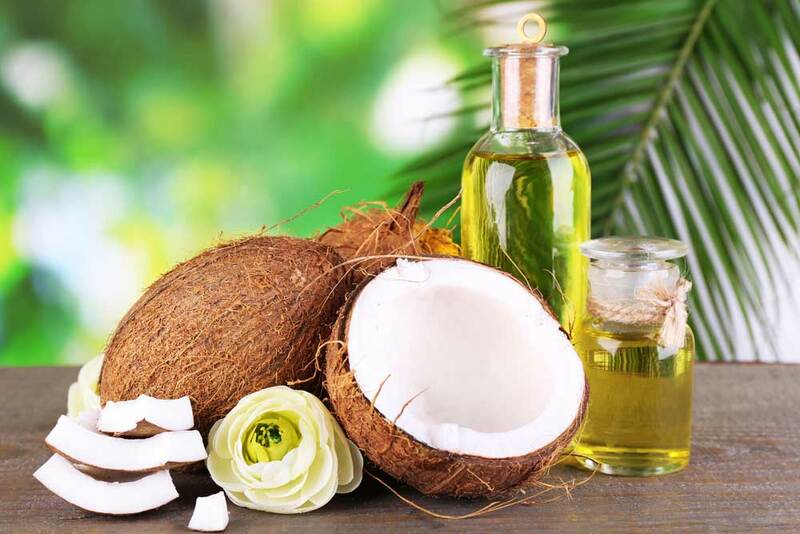 Coconut oil has been used for centuries to help fight dandruff. The chemicals found in some of our hair products (such as parabens, propylene glycol, polyethylene glycol, sodium lauryl sulfate) are harmful and can create an environment that is suitable for dandruff. Fungi can also cause dandruff as well. Coconut oil contains anti-fungi, anti-viral and anti-microbial properties that can get rid of fungi and bacteria in our scalp and hair. In order to fight dandruff, apply about 2 teaspoons of coconut oil to freshly washed hair. Massage it thoroughly into your scalp and hair. Cover it with a plastic cap for at least 30 minutes. You can sit under the hair dryer as well for about 5 minutes. You can wash it out or leave it in your hair. Do this at least once a week. Coconut oil contains essential nutrients such as lauric acid that penetrates the shaft of our hair improving its overall health. Apply coconut oil to your hair and scalp and massage it for about 10 minutes. This will also improve the blood circulation to your scalp and hair. Dr Axe reports that the Vitamin K and E content of coconut oil can help make the hair follicles healthy when it is applied on hair. 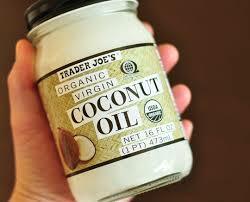 A study revealed that when coconut oil is used for at least 16 weeks, it can prevent breakage and damage. Coconut oil works as a hair conditioner for all hair types. It can be used as a leave in conditioner or just for a couple of hours before washing it off. It can also help prevent damage as a result of daily combing and styling. The harsh chemicals found in some of our shampoos and hair products can strip off protein from our hair follicles resulting in dryness and breakage. Our hair is made of a tough protein called keratin and its damage can reflect on our hair through breakage and dryness. A study was conducted, examining three oils; coconut oil, mineral oil and sunflower oil and coconut oil was found to be the only oil that helps reduce protein loss when used regularly on all types of hair, whether damaged or undamaged. Coconut oil can help prevent protein loss when it is applied to hair. For extensive conditioning, apply 1 teaspoon for short hair, 2 teaspoons for shoulder length hair and 1 table spoon on long hair after washing it. Apply it from scalp your to the end of your hair. Wear a plastic cap for about 2 hours or you can wear it overnight. Wash it with a natural shampoo and style. You may also choose to leave in the coconut oil without washing and style it as usual. After moisturizing your hair, apply coconut oil to help seal in the moisture. Moisture is one of the best things that can help prevent breakage, dryness and makes the hair manageable and healthy. Water is a good example of a moisturizing agent. Lice are embarrassing pests that love to invade our hair. Coconut oil can repel lice and prevent them from laying their eggs in our hair. Use it as a leave in conditioner to prevent and get rid of lice. The process should be repeated every 5 to ten days for some weeks. 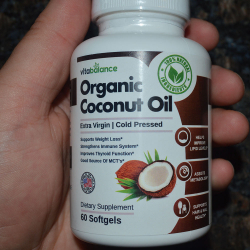 Some people might be allergic to coconut oil without knowing it. It is better to test it on a small area of your skin before applying to your hair. Coconut oil is not a substitute for treatment of some hair and scalp conditions. Always seek medical advice. Not all hair types will require the same amount of coconut oil. You need to experiment and see what works best for your hair.